Let your slow cooker do all the work with this simple crockpot recipe for slow cooker chicken legs with sun-dried tomatoes. After a mild December, winter has officially hit Toronto including icy temperatures and snow. I’ll be honest with you, all it’s making me want to do is cuddle up inside. If you’ve been reading for a while, it won’t come as a surprise that I’m all about using my slow cooker at this time of year. I’ve been using my slow cooker at least twice a week and have been developing some comforting soups and stews. But today, I’ve got a recipe that uses one of my favourite ingredients; chicken legs or drumsticks. I developed one of my favourite slow cooker recipes ever last year, my slow cooker jalapeno balsamic chicken legs, and this recipe I’m sharing today has a completely different flavour profile but uses the same technique for cooking the chicken legs. I love the way the chicken ends up so juicy and flavourful in the slow cooker, plus the leftover juices in the slow cooker insert make for the perfect sauce to drizzle overtop when serving. 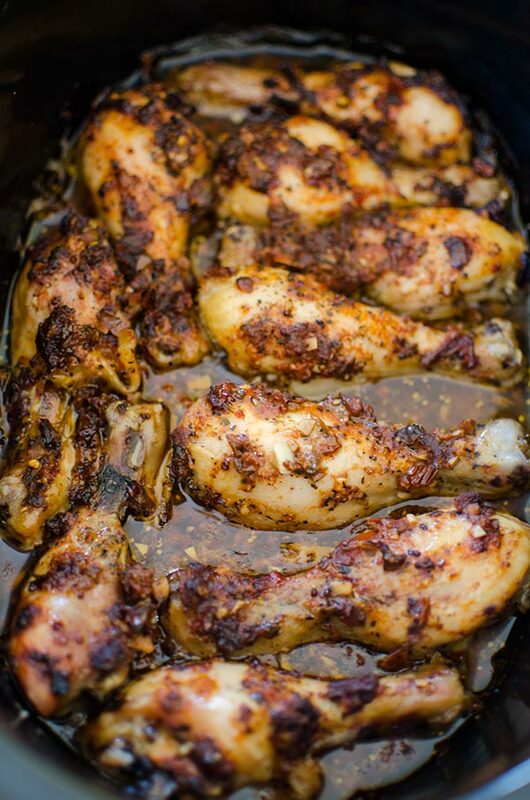 This method for cooking chicken legs is so simple all you need to do is place the chicken in the slow cooker and cover with a mixture of sun-dried tomatoes, basil, garlic, chili flakes, oil and Dijon mustard, turn it on high for four hours and walk away. The chicken will fall off the bone and the entire family will go crazy for these slow cooker chicken legs. The good news is that this recipe cooks in four hours on high in the slow cooker, meaning you can spend all afternoon binge-watching four episodes of Suits on Netflix, or reading or whatever it is you enjoy on a cozy afternoon inside. I have tried cooking chicken legs on low for 6 hours as well but have found that the results aren’t nearly as juicy as the chicken tends to dry out. 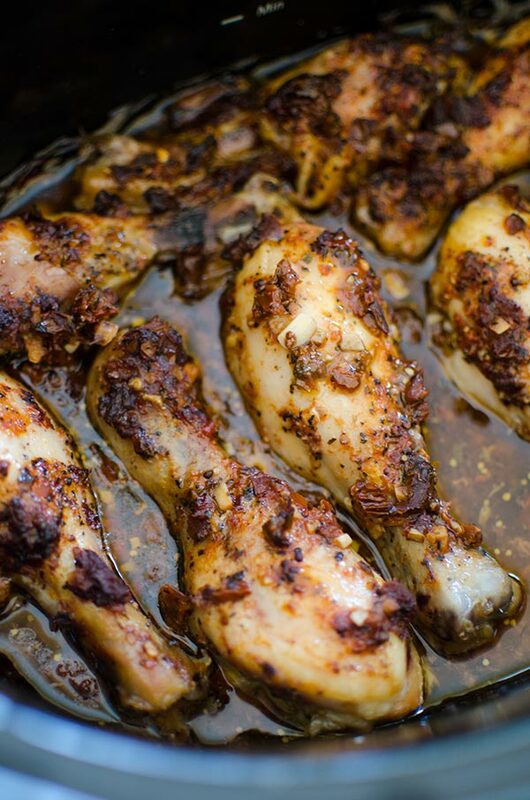 For these slow cooker chicken legs, I’m using sun-dried tomatoes packed in oil. They have an intense, sweet and slightly tart flavour. Because they have been dried, they also have a chewier texture. I use the sun-dried tomatoes straight from the jar and drain them before adding them to the mixture. But, and this is important, be sure to save the oil they are packed in. I use this extra oil as part of this dish to add additional flavour. Season chicken legs with salt and place in slow cooker insert. In a small bowl, whisk sun-dried tomatoes, water, oil, tomato paste, garlic, Dijon, basil and chili flakes. Pour over chicken in slow cooker. Cover and cook on high for 4 hours. Serve and drizzle additional liquid overtop as a sauce. Let me know if you give these slow cooker chicken legs with sun-dried tomatoes a try in the comments below. Luscious & Anxious to cook this dish. YUM!! !